Workday: Historic Ships of Baltimore:November 16, 2013 – Chesapeake Chapter U.S.L.H.S. 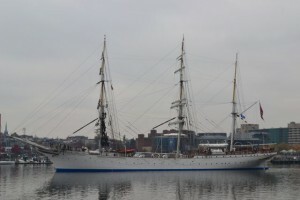 Tall Ship leaving Baltimore Harbor during our work day. We had six volunteers show up on Saturday November 16th for our last workday of the 2013 season on the Lightship Chesapeake. It was an overcast cloudy day as we boarded the lightship and began our work. 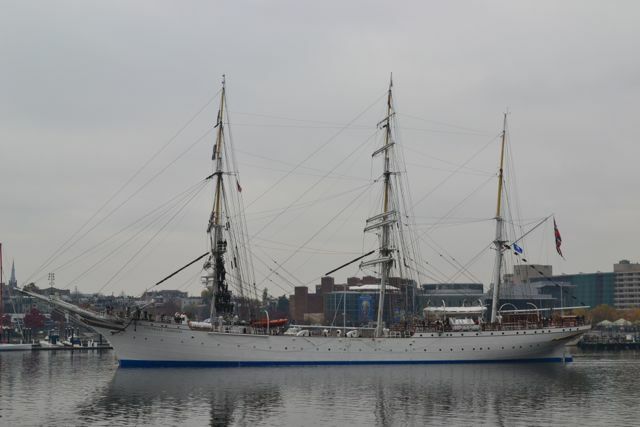 We were treated to the spectacle of one of the tall ships leaving the harbor (one of the many benefits of volunteering!). 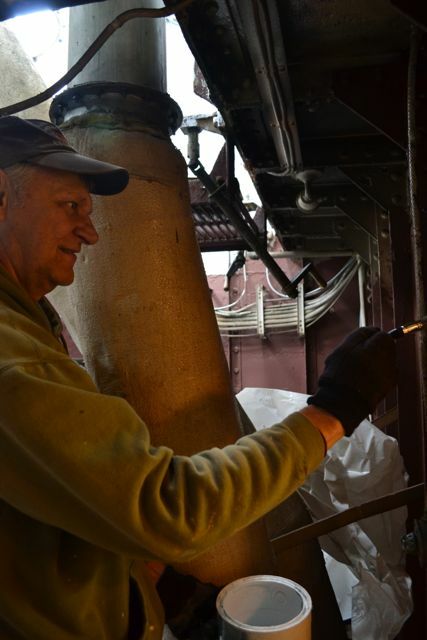 The sailors sang sea shanties as they stood on the rigging as the ship glided out of the harbor. I believe the ship was Norwegian, but I could hear refrains from “What Do You Do With a Drunken Sailor” while standing on the deck of the Lightship Chesapeake. It was quite a site. The photos don’t do it justice. We continued painting the upper fidley and it is beginning to look quite a bit better. Before it was dark and somewhat claustrophobic. Now with the bright white, it seems more spacious and open. 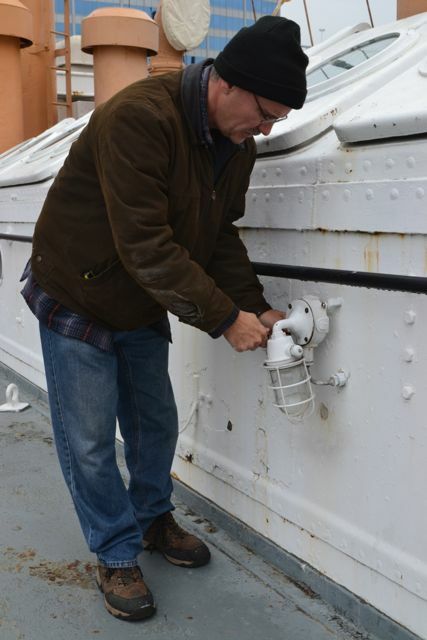 While that was being done, other volunteers worked on many other things including one of the light fixtures out on the deck above. 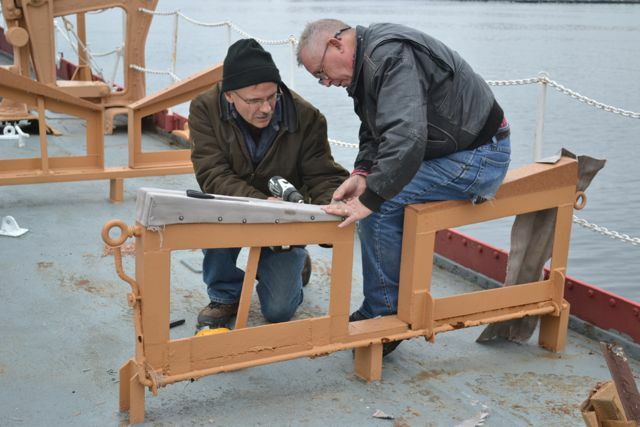 They also put some covers on the boat cradle so it looks a bit more authentic. The damage control locker received some more attention and also received a coat of white paint. Some more electrical work was done throughout and in that theme (well sort of) we inspected a string of holiday lights that will be put up later. We also put a little tree in the Captains cabin to give the ship a bit of a holiday cheer. Andy and Hobie working on the boat cradle. 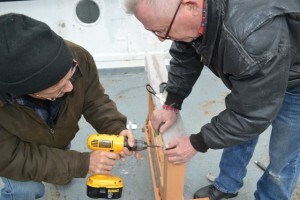 Andy and Hobie attach covers to boat cradle. Tony painting bulkhead in fidley. 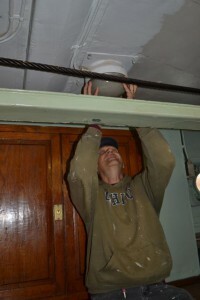 Andy fixing light fixture on deck. 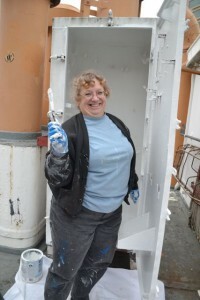 Heidi painting damage control locker. Tony putting cover back on light in wardroom. 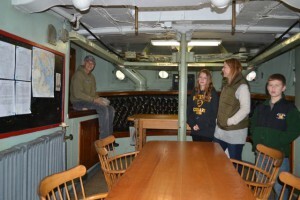 Tony talking to tourists aboard the lightship while working in the wardroom. 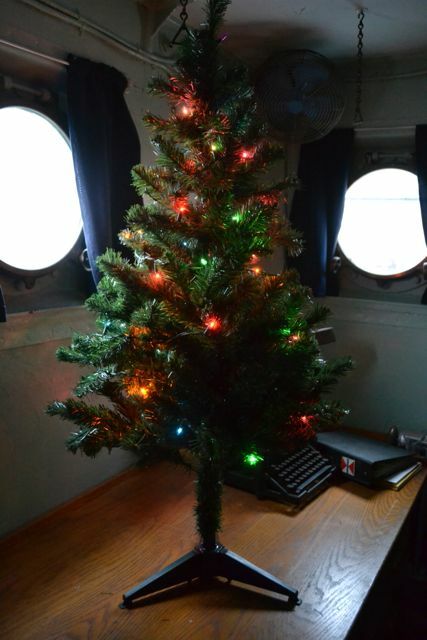 Tree decorated in Captain’s cabin.